Officials from the CDC and USDA will likely arrive in Mexico soon to help investigate the deadly new influenza virus that managed to jump from pigs to people in a previously unseen mutated form that can readily spread among humans. One of the first things they will want to look at are the hundreds of industrial-scale hog facilities that have sprung up around Mexico in recent years, and the thousands of people employed inside the crowded, pathogen-filled confinement buildings and processing plants. I don't know if it's a factor, but I sure hope someone's looking into it. 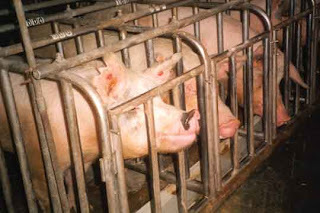 If so, this is an example of the collateral damage done by factory farming. The essential harm is done to animals, but in the process we accidentally harm ourselves.